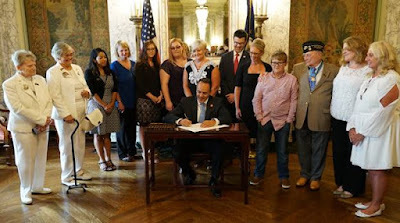 Senator Wil Schroder (R-Wilder) joined Governor Matt Bevin, Kentucky Gold Star Families, military personnel, and other supporters, including Congressional Medal of Honor recipient Hershel “Woody” Williams, earlier this week for the ceremonial signing of Senate Bill 122. The bill establishes a Gold Star Sons and Gold Star Daughters special license plate, which join the already-existent license plates for Gold Star Parents, Spouses, and Siblings. Call for your free class. Just mention "Fort Thomas Matters." 859-838-4555. This is an advertisement. According to the Kentucky Department of Veterans Affairs, Kentucky issued the first license plates honoring Gold Star Mothers—parents whose children have died in military service—with individualized plates in a ceremony in the Capitol Rotunda in April 2006. The Gold Stars Sons and Gold Stars Daughters license plates will be available beginning January 1, 2018. To apply for any of the Gold Star plates, you must provide special documentation to the Kentucky Department of Veterans Affairs. The KDVA will confirm eligibility and provide further steps to receive the plate. For more information, visit the KDVA website at veterans.ky.gov or call 502-564-9203.